While paying a visit to Europe in October, Erdoğan addressed an AKP rally in Strasbourg. Thousands of Turks turned up, waving Turkish national flags and listening to Erdoğan’s speech full of nationalistic references to epic wars that Turkey waged against Europe, a speech fraught with religious rhetoric. Europe should be on its guard and take this religion-driven Turkish nationalism very seriously, since history teaches that such statements may not end well. European politicians had better take notice of the fact that so many AKP supporters showed up in Strasbourg, so much so that the city is not a Turkish rural area nor are the Turks present at the rally simple villagers: to the contrary, the participants of the mass meeting have been living in Europe, the center of the western cosmopolitan world, for decades. Analysts should not downplay the symbolism used by the president of Turkey as meaninglessness. Erdoğan’s reference to the Battle of Gallipoli1, when the Ottomans defeated the Europeans, was chosen with care as a strong and unambiguous message. A direct parallel between the said historic event and the defeat of the European Union by the AKP can easily be drawn, and Erdoğan’s visit to Brussels could be interpreted as an intended humiliation of the European Union, with the subsequent visit of Chancellor Merkel to Ankara as an act of Europe’s capitulation. The way Erdoğan and the AKP have ruled Turkey for the past years is in violation of all the values the European Union is based on. Still, as long as Turkey regulates the influx of refugees into Europe, European Politicians and Brussels are willing to do everything to please Ankara. The offer by Brussels to resume the accession negotiations with Turkey was the ultimate surrender and humiliation of the EU. Turkey has done everything to show Brussels that it will never comply with the rules necessary to become a European Member country. With closing down Twitter, YouTube in 20142, being the world leader in jailing journalists for the 2nd year in 20133, the crackdown on the judicial system in 20144, there is no chance Turkey will ever be a European Union member. It is clear Turkey is far from being interested in becoming a member of the European Union: rather, Erdoğan has put the proposal to good political use, showing his fellow countrymen that it is not Brussels that imposes conditions on Ankara but the other way round. The European elite will have to eat humble pie in the end. Erdoğan feels abandoned by Europe and the US in the fight against Assad. Turkey does not get enough support from Europe for the burden of housing more than 2 million refugees. Germany and Great Britain support the Syrian Kurds with training and weapons5. The AKP regard the Syrian Kurds as the natural allies of the PKK. The AKP needs to prevent the EU from imposing sanctions on Turkey for the way the political opponents are dealt with there. While the Western media consumer is completely unaware of the root cause of the events as they are unfolding, European politicians do know that the key to the refugee problem is Turkey and Mr Erdoğan. The European political elite is paralyzed by the unfolding refugee crisis, not able to deal with the problem at the European or a local level. The European Union i.e. 28 member states, has to act collectively. As it is, most member states are trying to limit the number of refugees coming to them, while countries like Greece and Italy, because of their geographical location, are forced to receive most of the migrants. The European Union has no mandate or authority to have those people accommodated in areas or camps close to its external border. The implementation of European refugee policy has to be ensured by particular member states, most of them trying to limit their share of the burden. Erdoğan knows he is holding Brussels hostage, thus preventing Brussels from criticizing AKP’s ruthless way of dealing with its opposition and demanding extra money for housing the large number of refugees now living in Turkey. 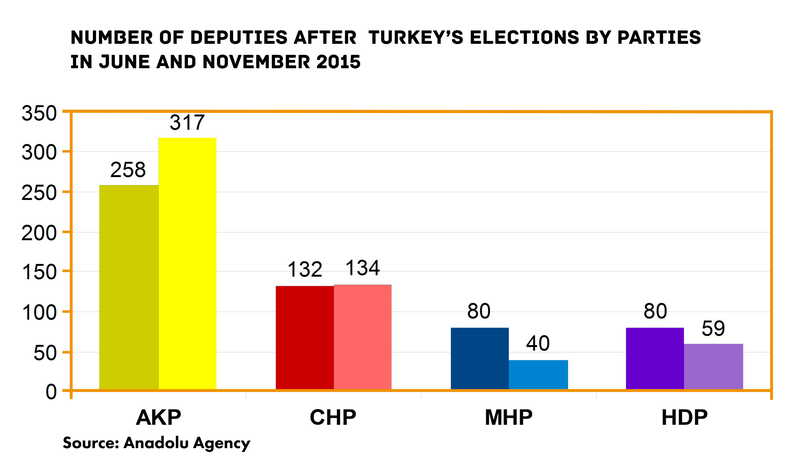 Chancellor Merkel’s visit just before the second general elections was a victory for the AKP6. Erdoğan must have realized he had literally broken the moral spine of Europe and could proceed with his plan to gain power, cost it what it may. Without any objections from Brussels two Turkish newspapers recently known for fierce opposition to the policies of President Erdoğan and the AKP turned pro-government overnight after their management had been seized by a prosecutor earlier this week. European citizens should be extremely wary of the cause of the events and the lack of moral condemnation for Turkey’s failure to observe democratic rules. The European Union sees itself as the basis for human and democratic rights, so an aspiring member state is expected to respect these values. After all, it is because the EU acts as the champion of the fight against corruption and tyranny, and styles itself as a promoter of good governance that it supports Ukraine in the latter’s dealings with Moscow. It is the first time in the history of the European Union that Brussels has rewarded a political leader who is violating all the values the European Union stands for. It may be an unfortunate, not to say a dangerous, precedent that while Erdoğan is in the middle of the process of literally removing free press, Brussels offers Turkey to resume the European Union accession negotiations. Erdoğan’s is not merely an electoral victory: it is Ankara’s triumph over Europe. The Turks did not only defeat Europe at Gallipoli in 1915; Erdoğan also defeated the European Union’s moral superiority. Angela Merkel’s capitulation will pave the way for the transformation of Turkey into an Islamic state with Erdoğan as its undisputed leader. Turkey restricted access to Twitter hours after its prime minister, Recep Tayyip Erdoğan, threatened to “root out” the social media network where wiretapped recordings have been leaked, damaging the government’s reputation ahead of local elections. Turkey detains 40 of the world’s 211 journalists behind bars. Turkey jailed more journalists than any other country in 2013, the second year in a row that the NATO member has outpaced China and Iran, a new prison census says. More than 50 Turkish police officers have been arrested on suspicions of illegal wiretapping and forming a criminal gang, media reports say. The suspects are part of a corruption probe involving the prime minister. The arms used against Turkish soldiers in the latest PKK terrorist attack in Dağlıca turned out to be German-made. Now, the German government needs to explain how the PKK acquired and learned to use the weapons.